You can see any number of street preachers in New Orleans during Carnival season (Epiphany, January 6th to Ash Wednesday). 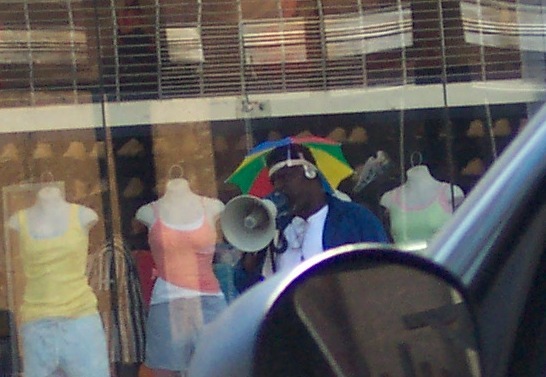 But this guy was preaching on Canal Street (usually at Decatur) in 1997 and he’s still there today. He had that hat in ’97, too. He sits more than he stands these days, but he still gets to the French Quarter by bicycle. If anyone has information on him or knows his name, I’d love to have it. The colorful genuine characters of the Quarter (like Ruthie the Duck Girl) are becoming fewer and fewer. They are being replaced by wannabe eccentrics- mostly hipsters with trust funds.